Erik Karlsson, a two-time Norris Trophy winner, was traded Thursday to the San Jose Sharks. The captain was widely rumoured to be on the trading block before the NHL draft in June, prompting emotional reactions from fans. From near Cup final to total faceplant — what's happened to the Ottawa Senators? Karlsson was dealt to the Sharks Thursday with prospect forward Francis Perron. In exchange, Ottawa got forwards Chris Tierney and Rudolfs Balcers, defenceman Dylan DeMelo, prospect forward Josh Norris, a conditional 2019 second-round selection and a conditional 2020 first-round pick. If San Jose re-signs Karlsson, Ottawa also receives a conditional 2021 second-round selection. Reaction on social media was mixed at best. Melnyk needs to be shipped off to Barbados. What a sad day in Ottawa. <a href="https://twitter.com/ErikKarlsson65?ref_src=twsrc%5Etfw">@ErikKarlsson65</a> All the best in San Jose, Erik and Melinda. You deserve better than what Ottawa had to offer. Looking forward to seeing you raise the Cup this year. Karlsson, who is set to become a free agent after this coming season, had spent his entire career with the Senators. He was drafted 15th overall by Ottawa in 2008 and was named captain in 2014 following the trade of former captain Jason Spezza. During his time with the Senators, Karlsson thrice scored the most points of any defenceman in the NHL, and was named an NHL first team all-star four times. The Swede won the Norris trophy as the league's best defenceman in 2012 and 2015. He holds franchise records for most points and goals by a defenceman in a regular season, and most points and assists by a defenceman in the playoffs. Karlsson led the Senators to the Eastern Conference final in 2017, but lost the trip to the Stanley Cup final with a single overtime goal by the Pittsburgh Penguins in Game 7. 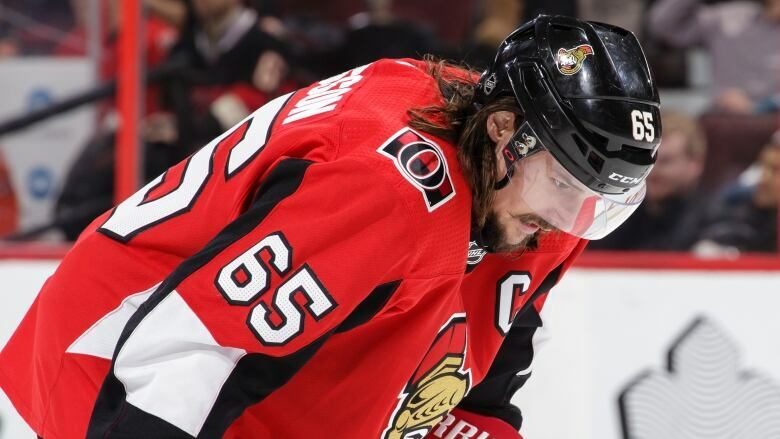 Karlsson had also been rumoured to be on the trading block heading into last season's trade deadline, but remained with the team for the season. After the deadline passed, Karlsson said he "never wanted to leave" Ottawa. He and his wife Melinda just launched a new anti-bullying charity with a fundraising walk in early September. The trade comes on the heels of the departure of Sens winger Mike Hoffman. 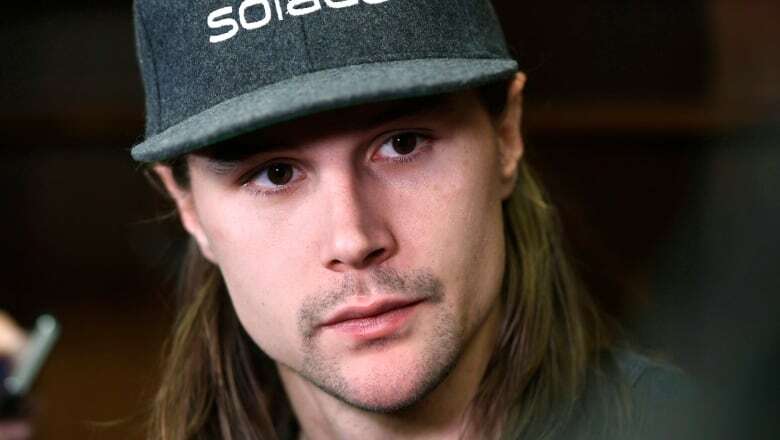 The Hoffman trade came after Karlsson's wife, Melinda, filed a peace bond in May alleging Hoffman's fiancée, Monika Caryk, posted hundreds of derogatory and harassing online messages aimed at the Karlssons. Hoffman and Caryk have denied the allegations and have not been charged in relation to the alleged harassment. Senators general manager Pierre Dorion said the Senators had to trade Hoffman because the team's dressing room was "broken." Karlsson's departure comes amid a rebuilding effort by the Sens. In letters to fans in March and September, Senators owner Eugene Melnyk pledged the team will change. The first, addressed to season ticket holders, acknowledged the last season had been a disaster, at least on the ice. 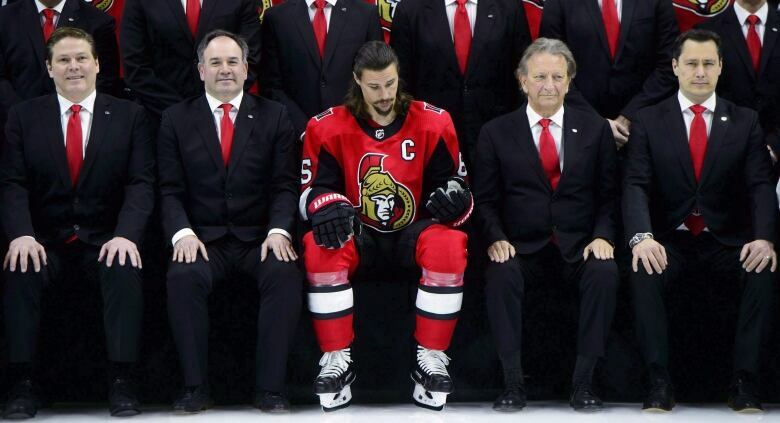 "Trust me, no one is more aware of this — and more frustrated by it — than I am," Melnyk wrote. "Enduring a tough year has given us a chance for clear-eyed evaluation," he continued. "This is an ongoing process but I can tell you one thing: we are not looking to just tweak our lineup nor mortgage our future for stop-gap solutions."